One more sweet treat before the weekend! Or for your weekend, as it were. Because it’s almost Valentine’s day! 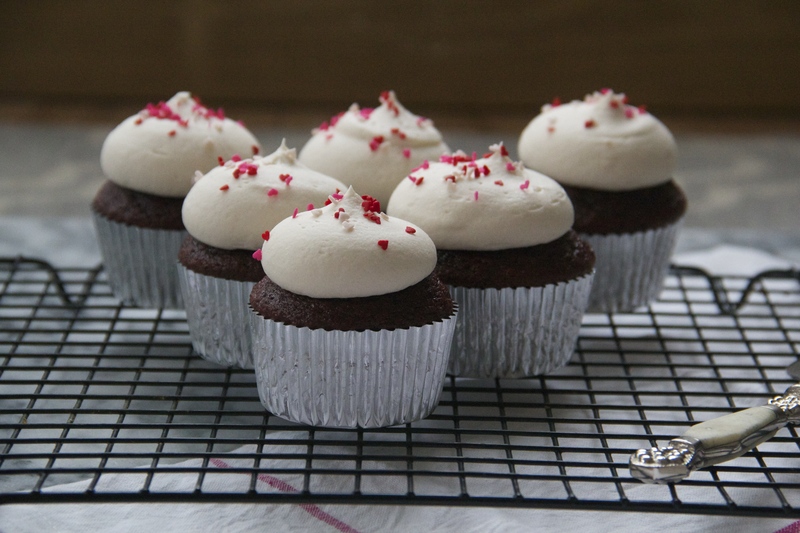 And just as peanut butter loves jelly, and spaghetti loves meatballs, and Mr. Darcy loves Elizabeth — like macaroni is to cheese and chicken is to waffles and Johnny Depp is to Chocolat, it is inescapably true that red velvet cupcakes and cream cheese frosting just GO. Together. Hand in hand. Cake in mouth. And who are we to argue, anyway? I like my red velvet cake with a heavy-handed spill of cocoa powder, for more of a chocolatey bite. This means that the red coloring gets a little bit muddied, but I don’t mind. The cakes come out out looking rich and dark, little Bordeaux-tinted lovelies, and soon that cream cheese frosting gets piled on and who’s even counting anymore? 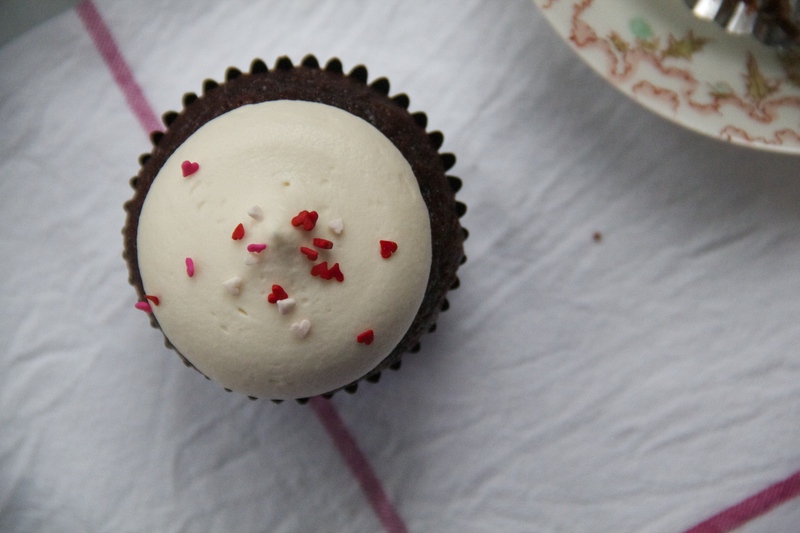 Heart shaped sprinkles seal the deal. Happy Valentine’s day, friends! Sending you love this weekend. Preheat the oven to 350 degrees F. Line 2 standard-sized muffin tins with paper liners (you’ll only need to line about 18 muffin wells). In a medium bowl, sift together the flour, baking soda, baking powder, salt and cocoa powder. Set aside. Combine the oil, sugar, egg yolk, and eggs in the bowl of a stand- or electric mixer, and whip on high speed until light yellow and slightly thickened, about 3 minutes. Add the buttermilk, food coloring and vanilla and mix on medium speed until combined. Reduce the speed to low and add the flour mixture in a slow, even stream. Mix just until combined, 30-60 seconds. Divide the batter into the prepared muffin tins and bake until the cupcakes spring back when lightly touched, and a toothpick inserted into the center of the biggest one comes out clean, about 20-30 minutes. Let the cupcakes cool completely before frosting. 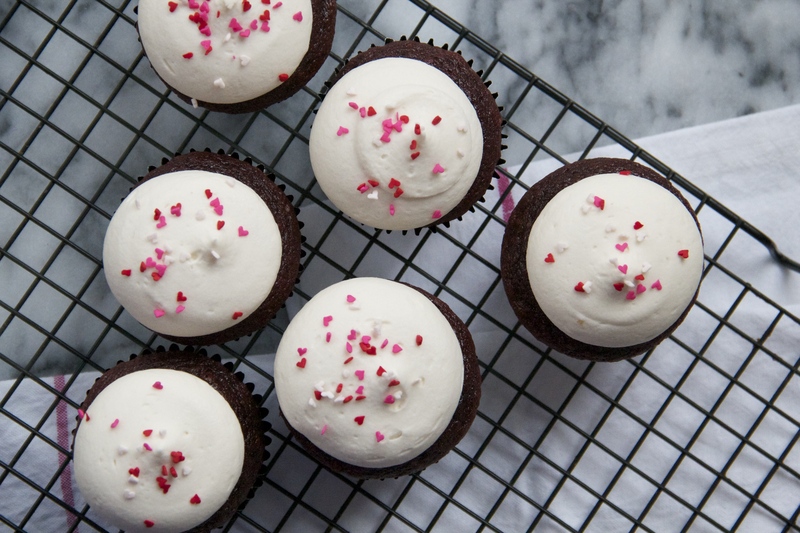 While the cupcakes cool, make the frosting: beat together the cream cheese and butter until fluffy and smooth. Add the confectioner’s sugar and vanilla, and continue to mix until completely smooth and bright white in color. 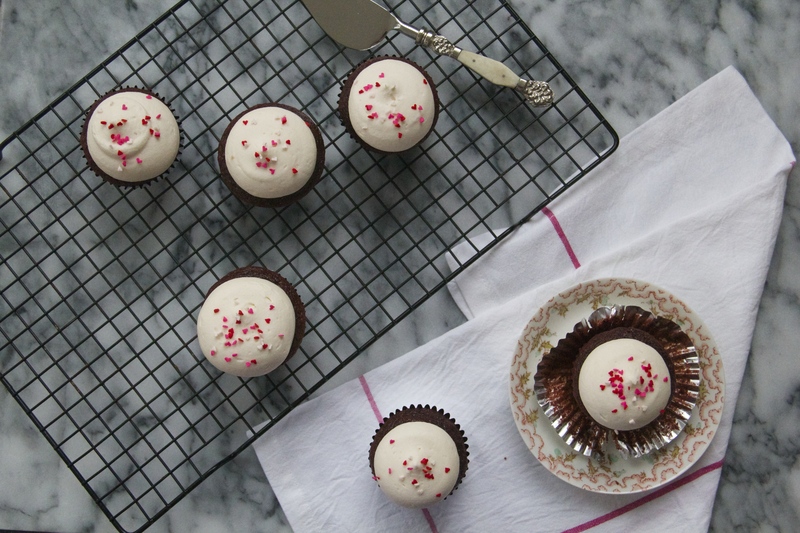 Spread or pipe the frosting over the cooled cupcakes, and enjoy! 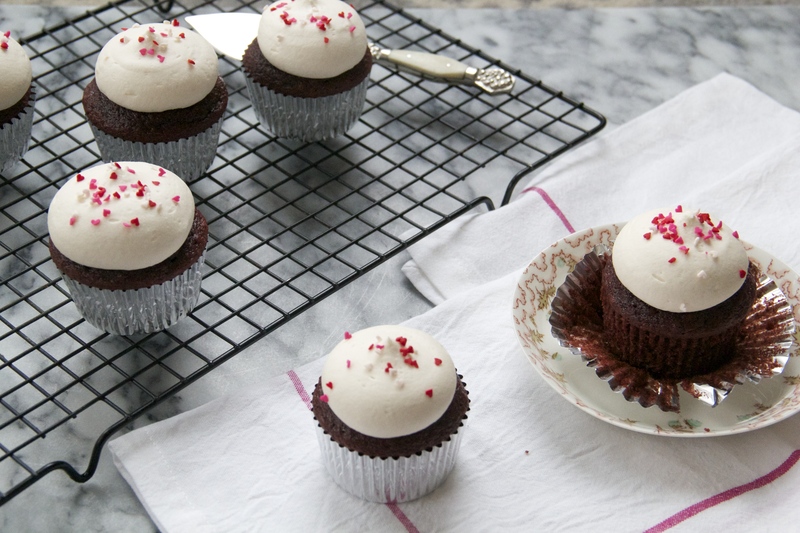 Note: unfrosted cupcakes will keep, tightly wrapped, for 3 days in the refrigerator and up to 1 month in the freezer. Frosted cupcakes will keep for 3 days in the refrigerator. Happy valentines day to all my peeps. Red velvet valentine!